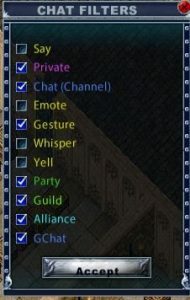 There are a number of ways to communicate within the game; ‘face to face’ communication, group communication (guilds, alliances and parties), broadcast through ‘speakers’ (communication crystals) for events and global chat channels. When communicating with people visible to you in game you have the option to speak, yell, whisper or emote by using different keystroke combinations preceding your message. This is done slightly differently, depending on which client you use. To speak to someone visible to you in game, simply type in the game screen. The words will appear as you type them along the bottom edge of the screen, and above your character’s head when you press the ‘enter’ key. This can be seen by anyone on the same screen. Prefixing your words with a semi colon, followed by a space, allows you to whisper. This can be ‘heard’ only by someone standing within one tile of you. (e.g. “;” “space” “psst, look behind you”). The enhanced client has two settings, ‘legacy chat on’ and ‘legacy chat off’. The keystrokes are the same but for legacy chat off precede each command by pressing the ‘enter’ key. 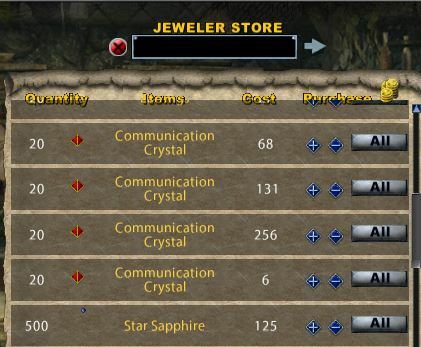 Communication crystals are bought from NPC Jewelers and come in two types, receiver and broadcaster. In addition the broadcaster is sold in three different capacities; 500,1000 or 2000 max charges. The only way to tell these apart on the vendor is by the price. The crystal costing 6 gold is the receiver while the more expensive crystals are the broadcasters (the more expensive the broadcaster the more maximum charge it has). 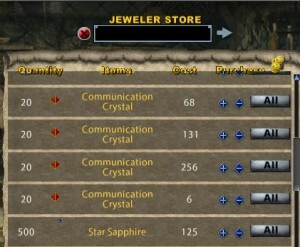 The jeweler also sells the gemstones you will need to recharge the crystal. To recharge a crystal, use the crystal and target a gemstone. The crystal will destroy the gemstone and regain some charges. Different types of gemstones recharge different amounts of charges (generally, the more expensive the gemstone, the more charges it gives). Double click your broadcast crystal and link it to your receiver, each broadcast crystal can be linked to 10 different receivers. The broadcast crysal will become active, and change color to green. Be warned each time you speak the crystal will consume one charge for every receiver its linked to. This means you’ll consume 10 charges if it is linked to 10 receivers. To activate the receiver crystals double click each crystal and target itself. An active receiver crystal is red and lit. When someone sends a message, the receiver crystal will bark their name and their message if on the ground. If the receiver crystal is in a player’s backpack, the player will see the message as a system message at the bottom of their screen. 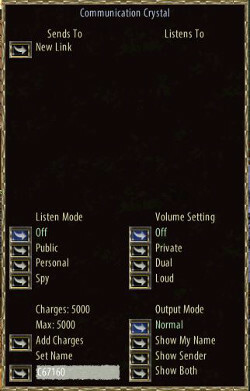 This improved version of the communication crystal was introduced in publish 77 and is craftable by a tinker. Unlike crystals bought from Jeweler NPCs, farspeakers will both transmit and receive in one and can work across sub-server lines. These are set through the improved user interface shown right. Like jeweler-bought crystals, 10 speakers can be linked and charges are restored through use of gemstones. 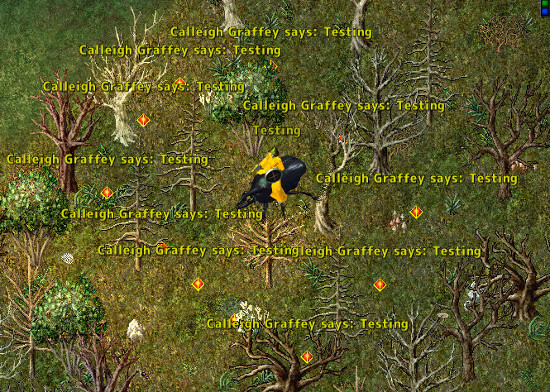 The maximum number of charges on a non-exceptional farspeaker is 5000, an exceptional farspeaker has 10000 charges; a GM tinker with no talisman has only a 40% chance of crafting the item and no chance of crafting an exceptional product. Only by use of a talisman is an exceptional example possible. Global chat is divided into ‘rooms’, messages sent this way are viewable to anyone in the same Chat as you, anywhere on the shard. 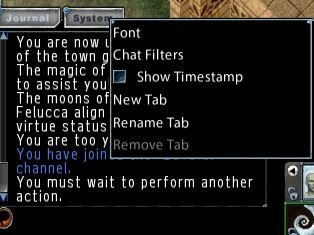 To speak in global chat, in either client, precede your message with a comma (eg “,” “space” “hello”) or /c in enhanced client. To change to a different room, or create your own room you will need to open the chat menu. 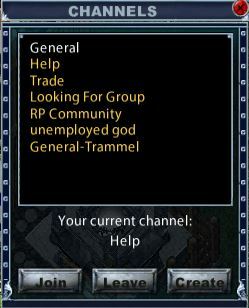 This is done from the top menu bar in classic client or from the chat icon on the default hotbar in enhanced client. 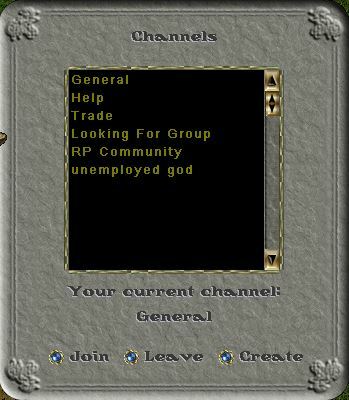 Clicking on ‘chat’ in classic client or the chat icon in enhanced client will open the gump pictured below allowing you to join, leave or create a channel. Click on the channel you wish to join, then click the ‘join’ button. Select which chat information you wish to see from the list. NOTE: The default setting for Global Direct Messaging (GChat) is off, you will need to turn this on to receive messages from people you add to your friends list. In Spring 2018, publish 99 Global Chat was expanded to include a friends list, Global Direct Messaging, full details of this feature can be found here.